We had a successful launch of the Green-Spaces Guide to North-East England at Saltwell Towers, in the beautiful Exhibition Room overlooking award-winning Saltwell Park. 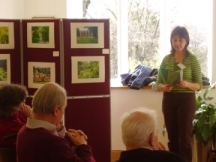 Nearly 50 pepole attended, and were able to view an exhibition of photos displaying lovely images of green spaces both within the North-East and within other areas covered by Green-Spaces Guides. We tested local green space knowledge & left some of the images untitled - there was much discussion amongst visitors as to where these places might be! Green-Spaces editor Moira Jocelyn, gave a short presentation about the fabulous diversity of green spaces in the North-East, briefly discussing their history, geology & hopes for the future. There was a question & answer session afterwards, where people asked about the significance of Capablilty Brown; about the future of town parks; &, an often-asked quetion - what are our favourite green spaces! Books were then on sale and refreshments were available downstairs in the Saltwell Towers cafe. 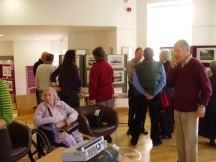 Before the launch, there was a write-up in the Hexham Courant which helped boost visitor numbers to the event.